Too much time having passed in the real world (Sept. 1st will mark 16 years since the last ep. of Crusade first aired on TNT.). Too many original cast members having passed beyond the rim necessitating a large percentage of new cast members and recasting (new actors as original B5 characters and/or original B5 actors as new characters). Too many false/failed starts (Crusade TV show killed by TNT-Atlanta (the poisonous, spiteful entity that seems to have killed the B5 universe. ), Babylon 5: Legend of the Rangers "Sci-Fi Channel Original" backdoor pilot that went nowhere, Babylon 5: The Memory of Shadows script that never got filmed, owned by others and looks like it'll remain under wraps forever, and Babylon 5: The Lost Tales (Voices in the Dark) single, very low budget, DVD release. ...but has there been any news on the latest B5 theatrical release that JMS was going to self-finance with partners (as opposed to crowd funding) for 2016 or so? Has JMS given up on it or pushed it off due to Sense8, etc.?. From what he's said at cons, the fact that he only has the feature film rights has made it difficult to attract investors and projects for Studio JMS have taken longer than anticipated (at least in part due to his double corneal transplants-he's fine now). So while it doesn't seem shelved, it's not his foremost project at the moment from what I can tell. I think there are two main reasons I want to see a Babylon 5 reboot movie. The first reason is that we all know the Babylon 5 Universe was so vast and detailed that there are so many possible stories to tell. We also know that there were so many stories that were hinted at and never told. We know there is a treasure trove of tales in that Babylon 5 Universe and a reboot could remake that Universe, but still be somewhat the same. The second reason is that we all know how great Babylon 5 was and what it helped do for what we see on television today. We all know that Babylon 5 deserves attention it didn't always get. We know that it should not be forgotten simply because the expansion of the franchise was mishandled. I want to say I feel like I am owed a Babylon 5 reboot movie in these times of every intellectual property owned by Hollywood being rebooted, but the reality is that Babylon 5 itself is owed a reboot movie. The show itself deserves the recognition of a real reboot. I don't mean JMS saying he is going to make it. That is great, but the reality is that until Warner Brothers, or another large entity, really gets behind him it isn't going to mean much. The show deserves recognition for helping to change Science Fiction, if not all, television in the U.S. Do you think shows would have started moving toward having one continuous arc without the influence of Babylon 5? 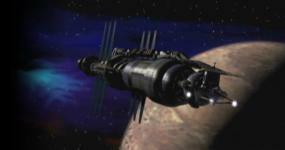 Do you think the new BSG and sooo many other shows would have moved toward this method without Babylon 5? Don't get me wrong, shows had continuous arcs before Babylon 5. The original Battlestar Galactica had a continuous arc, however, it wasn't quite as interwoven in the fabric of the show as Babylon 5. You might get a big reference to something that happened in a previous episode, but you certainly didn't get things, especially little details, setup in one episode and then delivered on as far down the road as two seasons later. Okay the original BSG is a bad example because it only lasted one season, but you get where I am going. SO my big points again are that the Babylon 5 Universe is so vast that it shouldn't be held hostage on the Warner backlot and Babylon 5 deserves to gain more attention rather than be lost in the shuffle. One other little note with reference to what you said about the fact that so many people who brought the B5 Universe to life have passed beyond the rim. I think a big motivation for many of us who want to see a reboot movie is that we want to see JMS make it. Like all of us, he isn't getting any younger. Honestly I worry that he is reaching a time in his life when he is going to retire. I don't see that actually happening though. I think JMS will keep writing until the end. As far as B5 goes I also worry that we will get a reboot, but not until he himself has passed beyond the rim. I've said before, I wonder if WB is sitting on B5 until JMS is gone in hopes they can buy back his ownership stake on the cheap. I mean you know in this day and age every studio's main purpose has become exploiting the intellectual properties they already own, so someone at WB keeps tabs on Babylon 5. Just as JMS wants them to sellout to him, I'm sure WB wants him to sellout to them. I'm sure he would only sell on his deathbed as a means to provide for his family when he is gone. I so wish they would either sell their stake in B5 to JMS or another studio who would properly help him re-create the Babylon 5 Universe. And another thing, I read there is new blood at Warner Brothers with the AT&T merger. I hope they do better than their predecessors. I think a big motivation for many of us who want to see a reboot movie is that we want to see JMS make it. Like all of us, he isn't getting any younger. Honestly I worry that he is reaching a time in his life when he is going to retire. I don't see that actually happening though. I think JMS will keep writing until the end. HEY! He's only 9 months older than I am! You're right, though - he'll never retire because he's a compulsive writer. He can't not write from what I understand. HEY! He's only 9 months older than I am! . Well then we are golden because we know you are a dynamo that will never stop. Speaking of which, getting excited for San Diego yet? Speaking of which, getting excited for San Diego yet? Sorta? Don't get me wrong, SDCC is always a great time. But since JMS won't be there and I didn't get the B5 Anniversary panel I'd applied for, not as excited as I might be. But also not as nervous over leading a panel! I haven't really checked Facebook lately. Will Pat Tallman be at San Diego? I think I heard some time ago that she wasn't going this year, but I believe I've heard that before and then she changed her mind and went. What about any other B5 alums? I know you don't care too much about seeing the actors anymore, but just curious if any of them will be there in case you need to start a 25TH Anniversary Insurrection. I imagine it wouldn't be too difficult to convince Tallman to get out in front on that. I always enjoy stopping to say hellp to Pat and collecting a hug (eat your heart out, folks!). She's delightful. I haven't noticed her posting anything but I'll watch out as the schedule starts rolling out in a couple of weeks. I thought I'd seen that Claudia was supposed to be ther but that's been a while also. I don't think I'd heard that one and I can't imagine who that person would be. I can say that, from an emotional standpoint, I can see it being a strain writing about subject matter that so many people who've passed away helped you bring to life.